Testing is set to start by the end of 2018, looking to cut costs and reduce emissions. Small groups of semi-autonomous lorries will be tested on major motorways in the UK by the end of 2018. According to the UK government, Transport Research Laboratory (TRL) has been awarded a contract to test vehicle ‘platoons’. These platoons, consisting of up to three lorries, will be travelling in formation, with the leading lorry controlling breaking and acceleration. At first, the tests will be done on test tracks, but before 2018 ends, we can expect these lorry platoons to hit the motorways. The leading vehicle will be controlled by a human driver. Humans will also control the steering in lorries behind – just not acceleration and breaking. One of the reasons for these tests is to see if there is a way to lower emissions and costs. If the lorries drive close together, the front one will push air out of the way, making the two behind spend less. Transport Minister Paul Maynard said the idea could later be passed onto consumers. However, not everyone agrees with the idea. Edmund King, president of the AA, thinks this project is not fit for the UK. 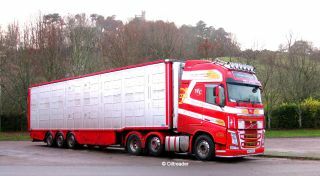 "We all want to promote fuel efficiency and reduce congestion but we are not yet convinced that lorry platooning on UK motorways is the way to go about it," he said, pointing out, for example, that small convoys of lorries can block road signs from the view of other road users. "We have some of the busiest motorways in Europe with many more exits and entries. Platooning may work on the miles of deserted freeways in Arizona or Nevada but this is not America," he added.